It’s been a while since I’ve caught up with you all, but after my first round of meds and IVF, we ended up with two viable embryos that needed to be tested for Fragile X. 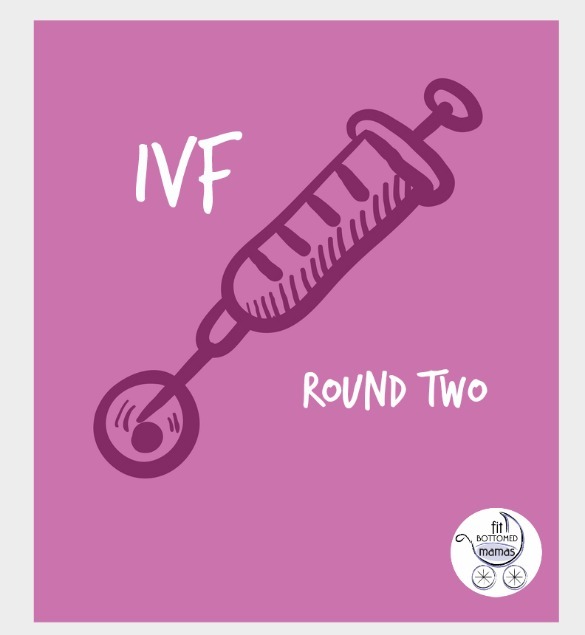 So my husband and I thought about it for a while and decided that two was a good start, but we wanted to try this whole crazy process one more time to see if we could end up with at least two more, as I responded to the meds pretty well in the first round. So after taking a couple months off last fall, the beginning of 2015 brought on a new cycle. I said after we completed the first round, which could be overwhelming painful at times, I was willing to go through it all over again if it meant we got more healthy embryos out of the deal. The more embryos we have the better in our case. The cycle the doctors gave me in the second round was slightly different than the first. They called it the Flare cycle. I think it’s meant to shock your body into producing more eggs. So you have half as many meds and the cost was half as much — sort of — but all the better for the pocketbook that time of year. ‘Cause man, this process is expensive and no joke. We did all the shots just like first round, but there were fewer of them obviously and everything went fine. I still got some bruises. My numbers weren’t quite as good as the first round, but still acceptable. I was hopeful, to say the least. After all was said and done, we thought we had about 8 to 10 follicles (or sacks around the eggs), which was pretty good. The problem is, you don’t know whether the follicle actually has an egg in it until the retrieval process. During retrieval, things didn’t go as well as we had hoped. We ended up with three eggs total — not as high as the 8 to 10 we’d hoped for. And after five days of testing in the lab, none of them made it to the Fragile X testing phase. Needless to say, this was one of the worst moments of my life. I felt like a failure and somehow like I didn’t do my job or hold up my end of the bargain. And as much as it was not the most important thing at that moment, I felt like we wasted our money on that round. (I know, not what I should have been worrying about, but it sucked to say that least.) It was a stressful time at work and that didn’t make it any easier. I certainly leaned on my husband and family and the man up above for guidance on what to do next. I was determined that after the second round that we would go ahead and do the testing on the embryos we had. But since we still had the lone two, I felt like I needed more counsel on what to do from there. We had a meeting with the doctor who is in charge of all this at a hospital in Kansas City and the expert in this case to discuss how to proceed. We weren’t sure if it made sense for us to do another round or if we should just test what we had or if we should take a break and come back later … so much ran through our heads. But after talking with the doctor and his nurse — who I might add has been the most wonderful person through all of this — we decided to do one last round. I knew that if I didn’t go through one more round and not give it my all that I would regret it. So we talked it through and looked at our bank accounts (there was only enough for one more round) and decided that we could do it one last time — after all, they only let you go through this three at a time. I did come to the realization after the second round that my body responds better to longer processes than shorter, quicker ones. The doctor said they use the Flare cycle for younger people most of the time because they respond better. But we decided that was not the way to go with me and my body. So the final round would be back to square one with the original cycle. So as I leave you after this round, know that it takes a lot to go through all of this and certainly to do it multiple times is even tougher. Make sure you have a good support system in place — family, friends, the man up above or whomever you lean on for support, but make sure you have it because you will need them more than you know.